Quintessentially Italian, this DOC Prosecco lightens the moment with a sophisticated sparkle. From intimate get-togethers to lavish parties, Enza is the star at any gathering. You’re sure to fall in love with this refreshingly crisp, classic Prosecco. Enza is produced by the family-owned Cantina Sacchetto, founded in 1915 by Sisto Sachetto. Today, Daniele Pozzi is the lead winemaker and carries on the tradition of producing DOC wines in Veneto. 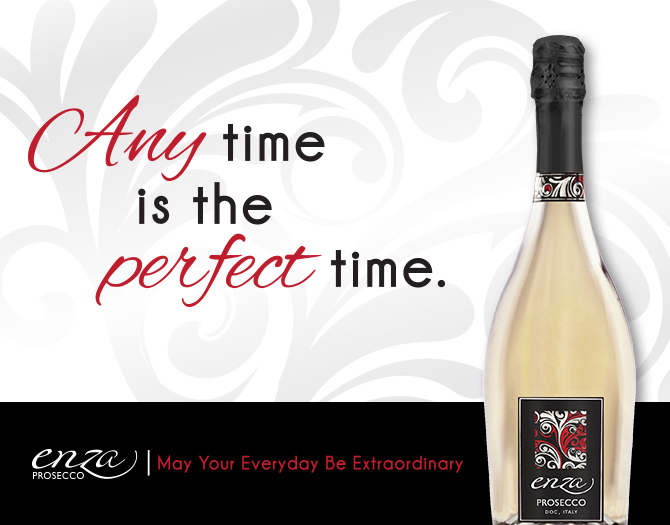 Enza Prosecco is made from 100% Glera (Prosecco) grapes and is grown in the Prosecco DOC region in Northeastern Italy. The bouquet bursts with fruity scents of pear and green apple with a lightly floral, citrus note. In the mouth, this wine exhibits the same characteristics as in the nose but is highlighted with a touch of peach and honeysuckle. Enza Sparkling Rosé is made from 95% Glera (Prosecco) and 5% Merlot and is grown in the Veneto region in Northeastern Italy. It displays the flavor of strawberries bursting from the glass with well-balanced crisp acidity and fruit sugars. Notes of green apple, rose petals and honeysuckle delight the palate.